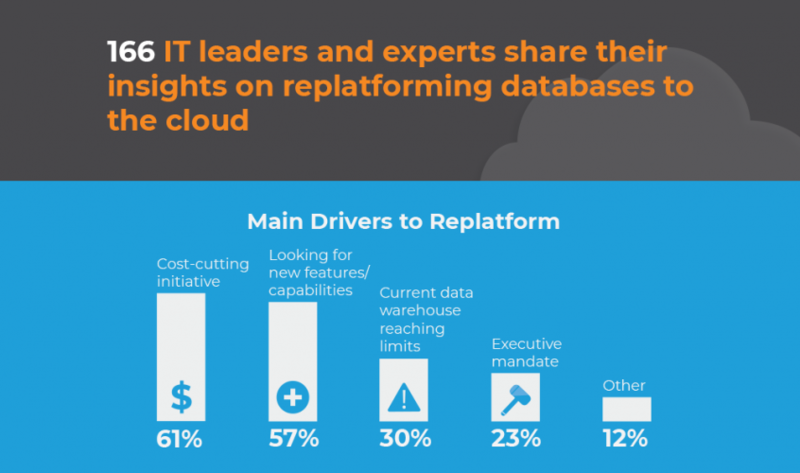 San Francisco – July 11, 2018 – Datometry, the leader in Adaptive Data Virtualization™ technology, announces the results of its recently concluded Database Replatforming Survey focusing on the drivers and challenges of replatforming databases to the cloud. Respondents identified the urgency to move enterprise databases to the cloud with an 18-month or shorter deadline to adopting cloud databases. The two top reasons to replatform data warehouses to the cloud are cost-cutting initiatives and the need for new features and capabilities. The key challenge in replatforming is the technical effort involved in rewriting existing applications for the new cloud data warehouse. “The survey results were not a complete surprise because we have been hearing our customers and partners talk of the urgency of adopting cloud databases for the last 18 months. The cloud economics for enterprise IT where it no longer owns and operates technology resulting in significant reductions in CAPEX and OPEX is simply too advantageous for the enterprise to ignore.” says Sonya Pelia, Head of Marketing at Datometry. Over 160 respondents answered the survey questions; the respondents included IT executives, database administrators, and analytics and business intelligence gurus from multiple industry verticals including technology, financial, healthcare, government, telecommunications, and industrial among others. View the survey results here: Survey Results: Replatforming On-Premise Data Warehouses to the Cloud. Datometry partners with leading cloud service providers and database vendors including Microsoft, Amazon, Google, and Pivotal and is available on Microsoft Azure Marketplace, AWS Marketplace, and Pivotal Network. Datometry (https://datometry.com/) is empowering global enterprises to gain competitive advantage by up-leveling their data management to become cloud-native quickly and effectively. With the company’s suite of SaaS solutions, enterprises can replatform existing data warehouses to the cloud at up to 80% savings of replatforming time, cost, and risk, and without application rewrite. Powered by Datometry Adaptive Data Virtualization™ technology, the company’s SaaS offerings include: Datometry Hyper-Q™, the flagship product enabling replatforming of existing applications on any cloud database in real-time; Datometry qInsight™, the only product in the market to provide unprecedented insights into data warehouse workloads; and, Datometry qShift™ automating the generation of optimized destination data warehouse schema.